A talk given to the London Numismatic Club on 3rd May 2008 by John Roberts-Lewis. If you live in a part of Britain whose water supply is provided by Thames Water Company you may, like me, have seen a pamphlet on behalf of the Charity “Water Aid”. It appeals for donations to provide clean water for thousands of people in Africa and other areas, the funds are used to dig wells, provide standpipes, etc. Unfortunately this problem is not a modern one and we can go back more than a Century for numismatic evidence of efforts to solve it. 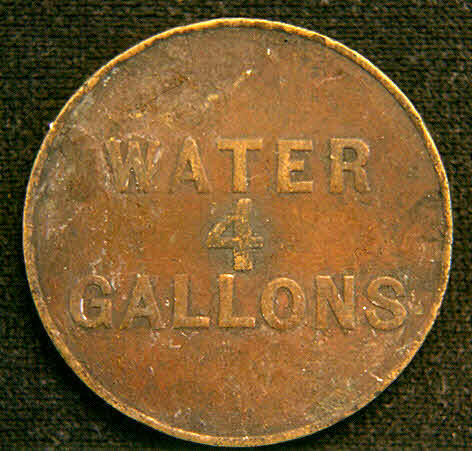 A uniface 22mm token with a basic four line inscription and no date was struck in 1898 according to the Heaton Mint, Birmingham order Books, (Figure 1). 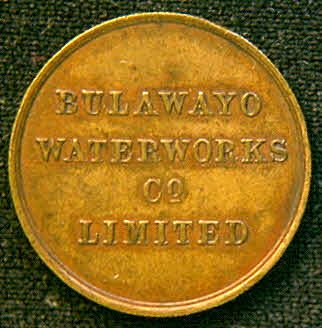 No account has been found of how the token was used, but since it refers to the Bulawayo Waterworks it is likely that it was supplied to customers, probably at a discount, so that they could pay the Company water-cart drivers for a fixed amount of water. This avoided handling cash and may have helped with a shortage of small change, likely at this date. No value or quantity is stated and this would have enabled flexible use over a long period. Many specimens show signs of considerable wear. 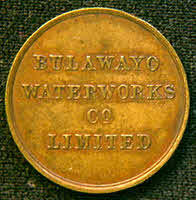 Bulawayo was the Royal village of Lobengula, king of the Matabele and had been captured by British South Africa Co. forces in 1893. It was a strategic location in Rhodesia and the railway from South Africa to Rhodesia and the north went through it as well as the one from Salisbury to Beira in Portuguese East Africa. 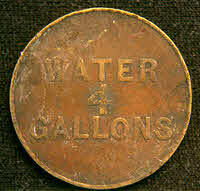 Only two other water tokens are known to me from Southern Africa. 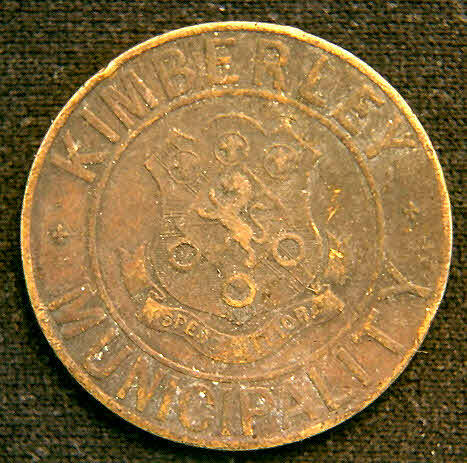 One was issued by The Kimberley Municipality and the obverse is shown in Figure 2. Struck in brass, 35.6 mm diameter and 2.4 mm thick it uses the Arms of the Municipality. Under a rampant lion is the Latin motto “ SPERO MELIORA” translated as “I hope for better things”. This is also used on the Arms of the Laird Family of Birkenhead and was mentioned in my Members talk on 5th June 2007, as being on the Macgregor Laird token of West Africa, however no known connection exists. 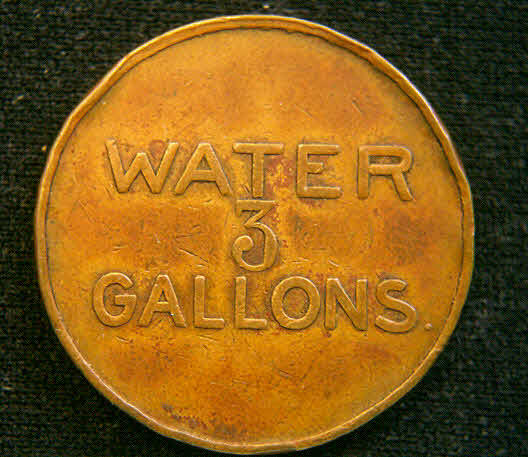 Figure 3 shows that the token, bought 4 gallons and cost a halfpenny, according to a former Town Clerk, who also said that they were used for certain between 1913 and 1921, to obtain water from Municipality stand pipes. These large and heavy tokens operated slot machines and were struck at the Heaton Mint, Birmingham whose records have an entry for 4th May 1914 “5000 tokens to sample”. According to R.N.P. Hawkins this wording indicated a repeat order explaining the use in 1913 and perhaps earlier though no entry for the initial order was found. 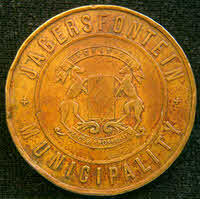 The other token was issued by the Jagersfontein Municipality in Orange Free State and is also large struck in bronze, 37.5 mm in diameter and 2.5mm thick. 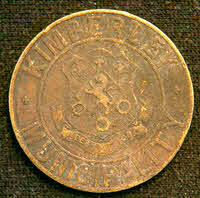 Though no value is stated it became known as “the water penny.” Figure 4 shows the obverse, with the Municipality Arms and animal supporters. On the ribbon above is EXCELSIOR and below PEACE AND PLENTY. The token was also struck by Heaton as two orders of 5000 each in the order book for 1913 according to Dr. G.P. Theron. The three gallons of water supplied for the “penny” (Figure 5) was not as generous as in Kimberley’s charge. This is surprising because in 1913 Jagersfontein was described as “having plenty of water.” It had however not been laid into much of its housing. Instead 41 pumps at a cost of £1900 were bought and were in use from 1913 to 1926. Some can still be seen because in 1985 the surviving 18 were declared a National Monument. Each is three feet high with a lion’s head at the top delivering the water after the token was put into a slot on the left hand side and a small lever pulled.